Interestingly, this blog is coming out the day after the election. We now know who is to be our next President. Are you surprised? Annoyed? Dismayed? None of the above? All of the above? Did something happen in the past week that changed the entire election process? I was kind of anticipating that, but as I am writing this a week in advance, I’m not sure what it is yet. Regardless, know we are protected and safe and loved beyond measure as we go forward with all of the changes taking place right now in our country and certainly on our very planet. The Earth is shifting and so are we. Can you feel it? – that somewhat lopsided feeling that has you out of nowhere, reaching out and grabbing onto something as though you’ve had an instant of vertigo or simply lost your balance? I know how that feels….What’s more, is that the angels assure me that they are ever more present than we even thought possible. What incredible support we have…support that will bring us into this new period of revelation and enlightenment. Some are fearing this. I can’t help but wonder why….Are they so addicted to the familiar, no matter how dysfunctional it is, that they see doom and gloom in every corner, rather than transition? I have asked Anna and the angels to lend us some insight on this, and they are telling me that we already have it! Imagine that…..We already have all of the insight and knowledge that we need to move forward and some of us remain stuck in the mire anyway. How odd….. I for one, have an incredible feeling of hope and am looking forward to change. I for one, am not satisfied with the status quo….nor do I dwell in days gone by, thinking them so much better. Of course there are wonderful moments to be gathered from our own personal histories. Nostalgia is a beautiful thing. However, the children of today will be equally nostalgic when they are our age. That particular desire to stop time and hold onto the comforts of toddler-hood when we felt safe and loved is not unique to us. Every generation before us has experienced the same. On the same token, every generation before us has also experienced their own dark nights of the soul. Our parents who grew up in the 20’s dealt with the Great Depression and World War I…and remain nostalgic about their childhoods. Siblings died of childhood diseases, now eradicated. What did the generation of the 20’s and 30’s remember most? The Charleston! Dancing happily while all kinds of events occurred simultaneously…. The young adults of the 40’s suffered indescribably as a result of the Second World War. Nevertheless, when you speak to these people, they reflect upon heroic moments, experiences of living in strange places they would have never thought they would live in, and the music!! Oh, how the people of the 40’s love their music. Glenn Miller! Frank Sinatra!! I do believe it saw them through the hardest of times. Those being persecuted in Nazi Germany continued to play their music and entertain each other in the concentration camps! Music always stands as a firm foundation, a lover, a healer, a friend ….Music is a staple of life! Aristotle taught that music was the most perfect art having many powers since we both hear it and feel it and he did not even know about sound waves. He gave it many powers and here we are still giving music a special place. Be it rock, Mozart, country, or hip-hop Hamilton, ain’t nothing like it. 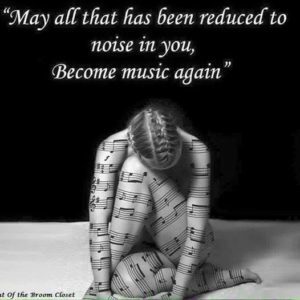 Personally, I am a frustrated musician; all of the music is in my head. My music is simply words on paper—nothing so memorializing as a familiar tune which comes to mind when most needed. Even the angels work with music. So often, it seems as though the perfect song with the perfect message comes to us at the perfect time…..
Those who grew up in the 50’s…Major wars may have been over, but what of Korea? What of polio? What of stay-at-home moms who baked bread and cookies and let us lick the bowl? Being a stay-at-home mom was such a privilege after the Rosie the Riveter era! And what of Rock and Roll and Elvis?? Those of us who experienced the 60’s remember the nightmare of Viet Nam, losing friends and loved ones to a nonsensical war….The birth of the drug culture….How many friends did you lose in Viet Nam or to a drug overdose? The Civil Rights battle (the real one, not the pretend one they are trying to duplicate now)…Not one, but THREE horrifying assassinations that affected our psyches for years to come. Make no mistake; the anxiety and depression of this generation had their foundation in those violent events of the 60’s. But…but….the Beatles!! The BeeGees!! The Stones, for Heaven’s sake…..And how do you feel when you hear “Hotel California” ?? The seventies and the hippie movement—a desperate attempt to regain the peace of mind lost in the 60’s. That’s all it was, really—not nearly as weird as everyone makes it out to be. And those who couldn’t regain that balance and stability they were so frantically seeking? They found some fake solace in drugs. Very fake. Very life-depleting. Very, very sad…..Ahhhh…..but the Beatles, having evolved, were still around and John Lennon was the voice of wisdom in the 70’s, was he not? Imagine….. Thinking maybe the 80’s and 90’s weren’t so bad….that maybe it was a pretty ok time to grow up… Perhaps then, our children will indeed have some lovely nostalgia. Either that, or because their lives were easier, might they develop a sense of entitlement? I suppose some have, but I’d be the last one to judge an entire generation and place them under one umbrella. Some brilliant minds came out of the 80’s and 90’s…Most of course were stifled by education. After all, many educational institutions at that time simply could not handle those brilliant minds, so they got the bright idea to medicate them. Keep them under control. Independent and creative thinking was indeed frowned upon. What if you were a child growing up in the 80’s and 90’s? The music was barely memorable, and you were already being exposed to the TRUE gateway drugs that would re-create yesterday’s illicit drug issues, but this time it would be legal. And now we come to the second millenium….The World Trade Center attack….Terrorism recreating the fears and angst of the 60’s…..Pharmaceutical companies and insurance providers seeing an opportunity missed in the 60’s, and having the audacity to dictate people’s lives by drugging them into a stupor…while chemical companies poison us, and big pharm is treating the poisoning with more chemicals….and we stand by once again horrified at the brainwashing of an entire generation lead to believe this is what is good and right for us! Where is the music now?? Oh, it’s there… Ever supportive, stabilizing, and bringing out the best in us….Because now my friends, we are surrounded by music of every age and generation…..all at once….Thanks to Pandora!! Yayyyyy….We can have it all—any music we want anytime we want. I am in Heaven. I sit here today, speaking to you while listening to Mozart. Why? Because I can’t write without Mozart. It’s really that simple. And prior? Well, I was dancing with my cat of course, to Michael Buble’! Michael is wonderful for morning exercise, as is my cat Gabby, and my dog Jack. They enjoy dancing with me. Or do they simply tolerate me? No, I think they enjoy it. They don’t fight to get out of my arms, and Gabby purrs the whole time. Jack—well, if dogs could roll their eyes, he would be….but he remains in my arms and hugs me back as we dance to Michael. Need a mood changer? A healer? A lover? A friend? It’s all in the music. Music is one of the most powerful healing forces available to us today. Waltz music rhythms can ease indigestion. Classical and baroque music is good for the heart. Did you know that a French minuet can help ease respiratory problems? Those of us over 40 tend to respond more physically to jazz music. It is no accident that some of the steamier scenes in the movies have a background of saxophone music, a vibration which very closely resonates with our most basic instincts. The under 40 crowd will respond more readily to guitar music for the simple reason that their lower vibrations are less mature and therefore resonate to a ‘twangier’ sound. The Native American flute raises our higher senses, opening us up to insight, intuition, and a greater spiritual awareness. And lest we forget…….Who isn’t somewhat addicted to Christmas music? What warms our hearts more, or triggers our nostalgia more than the sound of a good Carol of the Bells? Why are we always a bit delighted when listening to a Pandora mix and a Christmas song comes on…..in….July? Life is musical. Listen to the sounds of the wind blowing in the trees or the rain as it falls upon the roof, or a river as it meanders its way downstream into a thundering waterfall. Why do we enjoy wind chimes on our porches” We are all about the music. We are vibrational beings and we resonate with tone. It is that simple. The tonal sound of ohm is what created us and we are constantly returning to it in the form of our own creations. Over the centuries, it has been music that is most remembered above all events, all circumstances. It’s not remembered simply because it exists. Music exists to draw us closer to our divine nature…by healing, uplifting, appealing to our creativity, and making us feel a little less alone, safe and loved—just as we felt as toddlers. Who wouldn’t want to cling to that, whether they had a talent for music or not? And if you do, don’t waste it. The world needs your music! Music is divinity. In the beginning was the vibration…and the vibration created a sound, and sound became music, and music takes us back to the beginning when it was angelic voices that we heard first. Music is a language. It is also arithmetic…. It is numerology! It is science. It is universal. It is the one constant that draws us forward from one generation to the next, by it’s gentle nudging….giving us the feeling of support whenever needed and reminding us that…..